From this block you can learn how to install JetBlog addon for Elementor manually. First, make sure that you’ve installed and activated Elementor page builder before proceeding to JetBlog installation. If you have problems with installing Elementor feel free to read the detailed Elementor documentation. Click on Add new button to upload JetBlog plugin from Your hard drive. Click on Upload button, which can be found at the top of Plugins page. Browse the path to JetBlog plugin and start the installation process. When JetBlog plugin is uploaded and installed you’ll need to activate it. 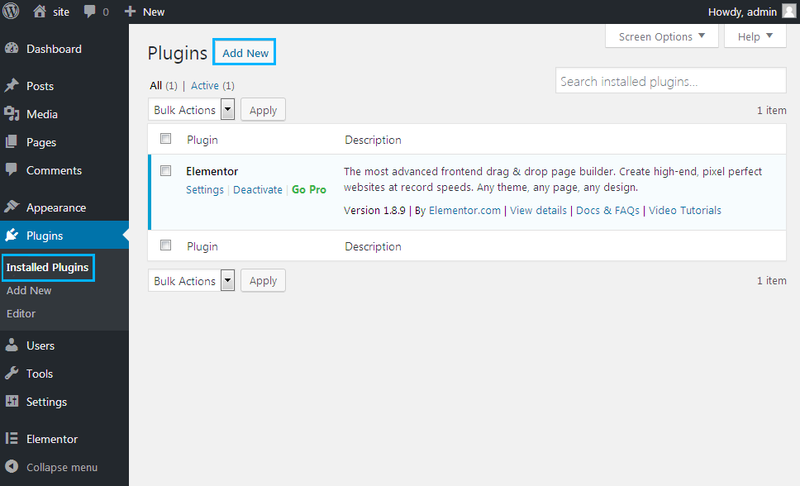 Navigate to Plugins tab and locate JetBlog plugin in the list of installed plugins. Click on Activate link under JetBlog. As a result the plugin will become active.